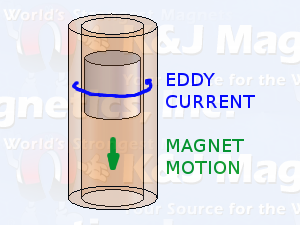 Learn how strong neodymium magnets can induce eddy currents, creating electromagnetic forces within metals like aluminum and copper which are not ferromagnetic (magnets won’t stick to it). When a good electrical conductor (like copper or aluminum) is exposed to a changing magnetic field, a current is induced in the metal, commonly called an Eddy Current. Perhaps the best way to explain it is to show its effects. This video shows the classic eddy current demonstration, dropping an axially magnetized magnet down a metal tube. In each case, the copper or aluminum tube has an inner diameter slightly larger than the magnet size. We used DAA and DEX0 magnets for these demonstrations. Green, magnetic viewing film used in the above video is available as our MV43. As the magnet drops through the tube, the tube sees a changing magnetic field. This changing field induces a current that circles around the tube. It’s a strong current that only lasts for a brief moment as the magnet passes. Now, when you see a current going around in a circle like that, it might remind you of an electromagnet. That is, a current going around in a circle like that creates a magnetic field. In this case, the magnetic field created by these currents of electricity is (overall) in the opposite direction of the magnet’s magnetic field. The magnetic field created by the eddy current opposes the magnet’s field, much the way a pair of repelling magnets repel one another. While gravity pulls the magnet down, the eddy currents create a magnetic field that resists the motion. Haven’t we seen this before? Yes! Consider our recent article describing the operation of a Shake Flashlight. In it, we moved a magnet back and forth through the inside of a coil of wire. As far as eddy currents are concerned, they don’t care whether that mass of copper around the magnet is a solid hunk, or a wrap of many turns of insulated wire – a current is still produced in a circular motion within the metal. The only difference between these two situations is that we were able to tap into the ends of the flashlight's wire and use the current to power an LED light. The magnet dropping through a tube is a classic example, but we’re not limited to that geometry. There are many ways to induce currents in metal. Anything where the magnetic field at a particular point in the metal changes with motion of the magnet will work. A popular setup for eddy current brakes is to set two strong magnets with a gap between them. This creates a strong magnetic field between the two magnets, as described previously in our Gap Calculator article. If this magnet pair is placed on either side of a spinning disc, the eddy currents induced in the metal will act to slow it down. This picture on Wikipedia is a good example. Another good demonstration is a simplified version: Let a thin disc magnet slide along an aluminum sheet. It works because of the same principles used with the magnet in a tube demo, but you can see the magnet the whole time. We used a DX02, 1" diameter x 1/8" thick disc magnet on a 2" wide strip of 1/8" thick aluminum for this demonstration. We already mentioned Eddy Current Brakes, where the opposing magnetic field can be used to slow something down. Such brakes are often used on trains and roller coasters. The picture at right is a good example of one such brake. 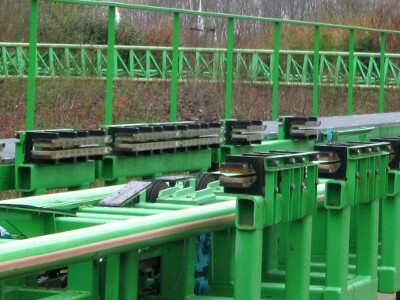 A copper or aluminum plate sticks out from the roller coaster car(s), not shown, and passes between the magnets shown. If permanent magnets are used, the brake works even with a complete loss of power. Eddy Current Material Separators can be used to separate metals from non-metal trash. For example, machines using this method can be used to separate aluminum cans from trash. Identification of metals: Coin operated vending machines utilize eddy currents are used to detect counterfeit coins. Because the eddy currents are different for a real coin vs. a fake one, makers of vending machines can use this to help make sure the coins are real. Eddy-Current Testing is a non-destructive test method for metals, which can be used to detect cracks in metals. Think along the lines of finding fatigue cracks in the skin of an airplane, or heat exchanger tubes in a power plant. Induction heating: The electric stovetops with a glass top use induction to heat up your metal pan or pot. See this page on Wikipedia which includes a neat picture of a disassembled stovetop, clearly showing the coil of copper wire used. When an AC current flows through a wire, much of the current is really flowing at the surface of the wire. This is commonly referred to as skin effect, but it's really caused by eddy currents. With AC current in a wire, the current alternates back and forth. This means the magnetic fields created by that current are, of course, changing. This creates eddy currents in within the wire, which resist the flow of electricity. If there were no such thing as eddy currents, you could get more current through a given wire. For another example, consider a transformer. Eddy currents are responsible for heating up the steel core of a transformer, as described here. Can I calculate the force of eddy currents? Figuring all this out is definitely not trivial. While we have a nice way of figuring out the magnetic field strength in the region of a single magnet in free space (see our Magnetic Field Calculator), the case of a magnet falling through a pipe is much more complex. The falling magnet induces a current in the pipe, which creates an opposing field of its own in the opposite direction. Determining the strength of that field theoretically is daunting. It's hard to make rules of thumb that will apply to every situation. To find some answers about the strength of eddy currents in your application, consider using experimental methods, three-dimensional FEA (Finite Element Analysis), or both.